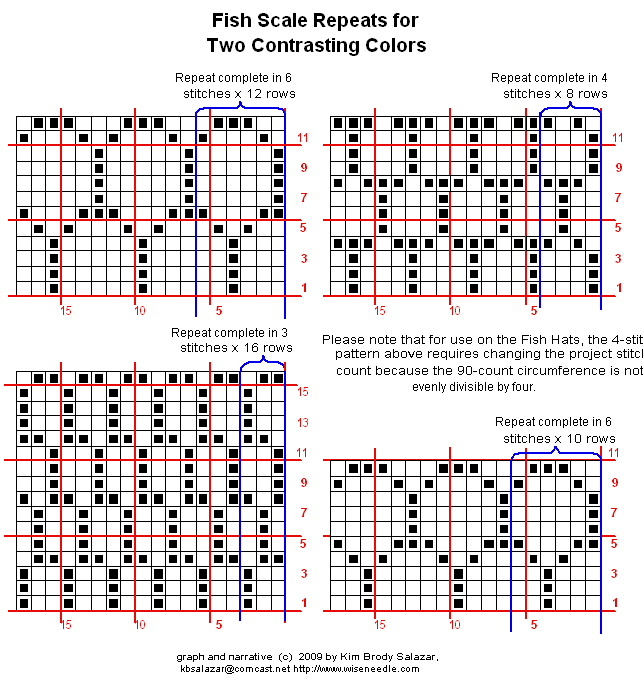 You can see that I used two of the four scale patterns from my last fish post in it, opting instead for plain stripes on the sections that were not divisible by 6 or 3. Now there’s just darning in all those ends, sewing up the tail, and placing the eyeballs. I’m holding off on final completion until I find out from the recipient whether she wants her hat dead or alive. I also started a new project – a baby blanket worked in modular knitting, along the lines of a traditional log cabin quilt. 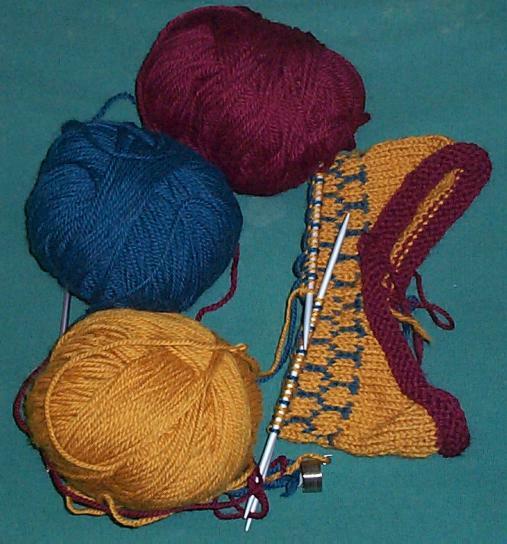 In typical heedless style, although I’ve seen patterns and descriptions of this style of modular knitting before, I’m not working from a pattern. I’ve got the image of what it should be in my head, and am stumbling towards execution by trial and error. I’m working in Austermann Batika Color, a cotton/acrylic/nylon blend that came out in 2004. I got a bag of it at Wild & Woolly in Lexington at their annual mid-winter sale, for an excellent price. This is a machine wash/dry flat yarn with an interesting texture – sort of a chainette bound by a tight nylon strand. As you can see, it’s a shaded yarn. Knit normally from horizon to horizon, the grays, creams and blues would make partial row tweedy stripes. Worked in narrow 12-stitch wide bands I’m getting more of an umbral effect. I like what’s happening with the color blending, and I like the analog to the traditional log cabin quilt block layout. I like the working method more than I thought I would. I’m not fond of the prominent seam ridges formed by using ssk to join. What you see is one night’s work, using up most of one ball of yarn. I’m thinking of ripping it all out and restarting, using a different join method. Possibly the long loop join I used in the Lightning scarf pattern. My fall-back is to do a standard throw using medallions knit out from the center, so that the color changes radiate with each medallion starting in a slightly different spot on the sequence. That would work well for this yarn, too – but would involve lots of sewing up, which I was looking forward to avoiding by using the modular technique. 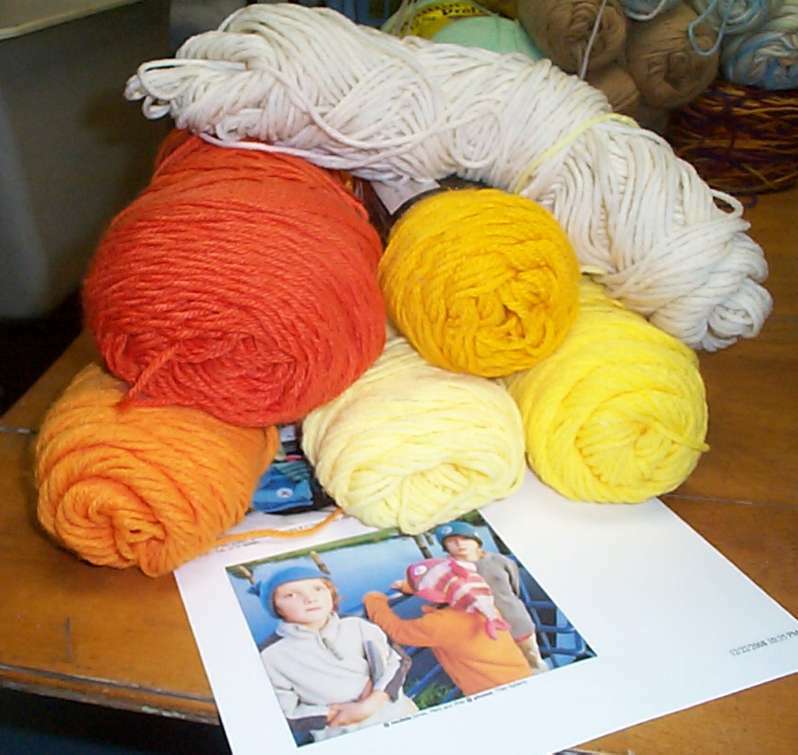 What yarn did you use, and at what gauge? We used oddballs and leftovers for the set of four – all acrylic mostly given to me by a dear family friend (Hi, Jean!). She is a big fan of yard sales and flea markets, and accumulates yarns of all sorts over the course of a year, to use as packing material when she sends gifts to the kids at holiday time. Some of her yarn I knit up myself, and some I donate to charity or to schools. Not all of the yarn I used for my fish hat retained its original label, but the skeins that did included Red Heart Classic, Lion Jamie (which I used doubled), Sears Best Worsted, Caron Sayelle, Woolworth Worsted and Phentex – a regular salad of mass market acrylics. With the exception of Jamie they’re all marked as worsted, but they’re really not. Except for Jamie they all work up (normally) at 4 stitches per inch, which makes them sort of in between bulky and light Aran weight. (Textbook worsteds knit up at 5 stitches per inch.) I did the fishes on US #7s, at the specified 4.5 stitches per inch, knitting these acrylics down in gauge somewhat. In this case the tighter gauge is acceptable, yielding a denser and stiffer and slightly more windproof hat. Also in this case – for kids’ sledding/snowboarding hats – washable acrylic is a good choice. I’ve seen how muddy play mittens and coats can get when the snow gets melty and worn down to grass. These hats can be thrown in the washer and dryer. Did you make any mods to the Fish Hat pattern? 1. After finishing the stockinette stitch mouth, I worked one row of the head color before leaping into the Shape Mouth section. 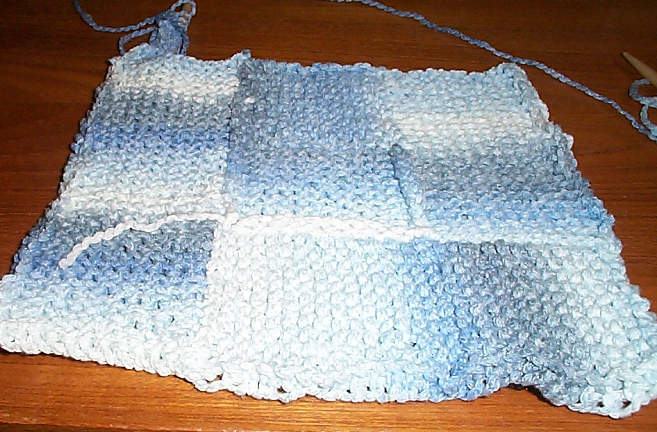 I did this so that any wraps I did would be embracing stitches of the same color. 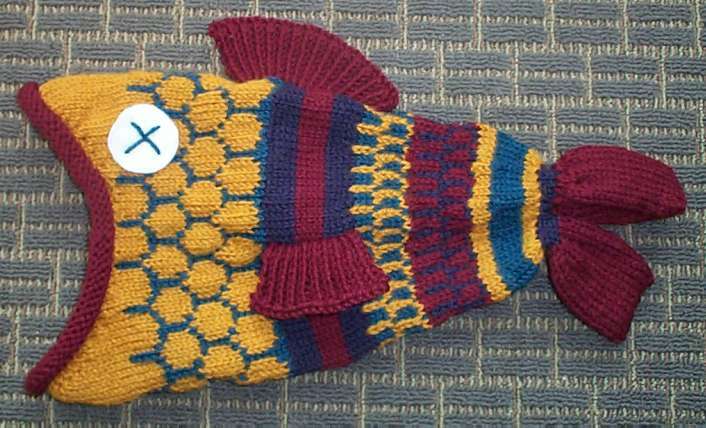 (You can see red wraps on white stitches in the pattern’s close-up of the pink-headed fish). 2. On one of the hats I did the knit the wraps trick. It made little difference in the overall appearance EXCEPT in one spot. 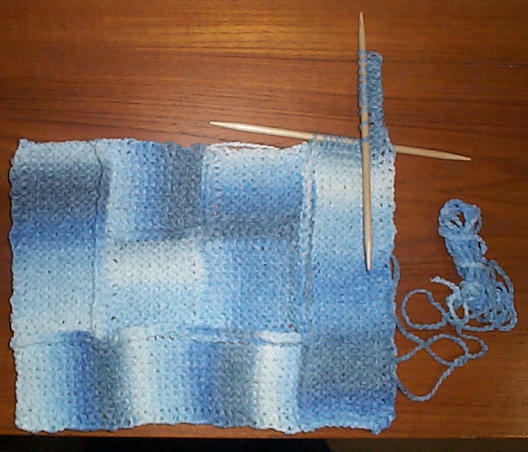 I strongly suggest knitting the wrap along with its carrying stitch on the last two stitches wrapped – the leftmost and rightmost ones. Otherwise you get a slight gap in the row behind the fish’s grin. It’s not necessary to do the others, but working the wraps formed on rows 15 and 16 does avoid holes. 3. When picking up the fins I identified the point on the body specified in the pattern for the first stitch to be picked up, then counted down the requisite number of stitches towards the tail. 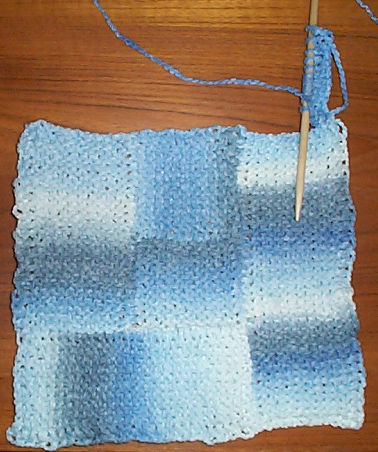 I held a length of yarn the same color as the fin on the inside of the body, and using a crochet hook, picked up my stitches. Once I had enough on my needle, I joined my working yarn on the outside of the fish and finished the fin. This left four ends per fin to finish: two of the scrap yarn on the inside of the body; and two of the working yarn on the fin itself. I found that picking up towards the head rather than towards the tail was much easier. 4. When working the fins, I did them entirely in twisted ribbing (k1b, p1b) to give them a bit more body and stiffness. 5. To sew up the fins, I used mattress stitch for the vertical seam and whip stitch for the cast-off row. Not yet. It’s a fun form, easy to play with, and faster than a sock. I’ve got a request from an adult pal for a hat. This one I’ll make out of some other all-wool leftovers. I’m pretty sure this set of remnants is Jamieson Aran weight 100% wool, bought as an experiment for a pullover that I ended up deciding not to make. I’ve only got four skeins of the stuff – these and a deep plum, but the recipient asked for no purple. Lovely stuff with great stitch definition. If these colors are not to her liking, I think I’ll keep this hat for myself. I’ve decided to rip back the small teal and gold scales shown, and restart the head section using a larger scale pattern. I’ll use a smaller scale variant closer to the tail (click on thumbnail below for full size). And yes, I use my wire Strickfingerhut for stranding at this weight, too. Possibly. 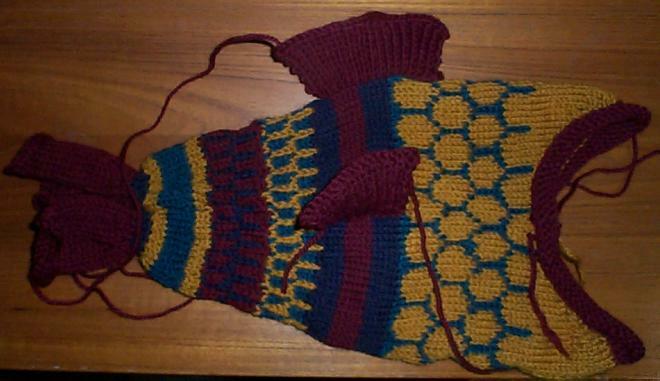 It would be easy to knit on a segment of sawtooth edging instead of the picked-up and knit-out-from-the body fins. I see a shark in the future. Or if I use a lacy edging for all of the fins, end of the body blunt and add a tail of the same lacy edging, perhaps an angelfish variant. But why stop there? I’ve got a body shape now thanks to this pattern. Fantastic fins, tentacles, catfish style whiskers – all manner of body mods are possible. Perhaps I’ll end up working some sort of sea monster. But to do that, I’ll have to find someone willing to wear a (woolly) aquatic nightmare through the winter. Here are all four, finished and ready to swim. Elder Daughter did the one at the upper left, with the lighter orange fins and tail. 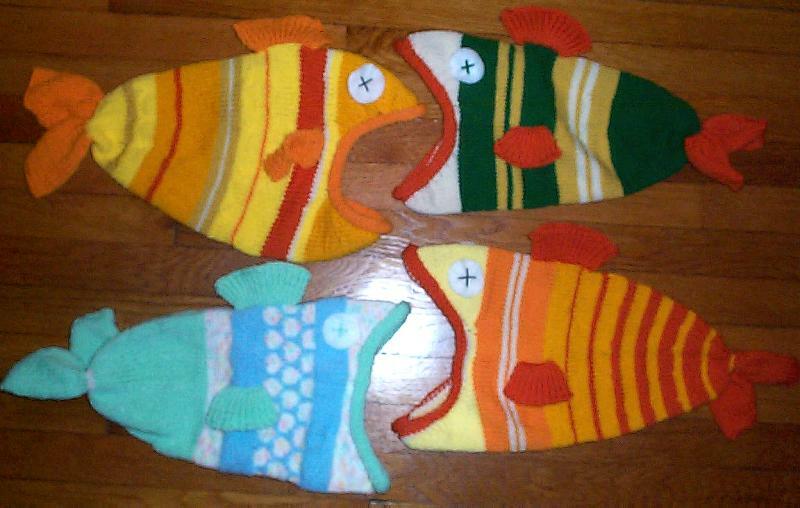 The two new ones are the dark green fish that looks something like a cross between an athletic sock and a trout, and the pastel fish, with its pattern of stranded scales. Dark green and pastel will be wriggling their way to my nephew and niece in Buffalo by Monday. 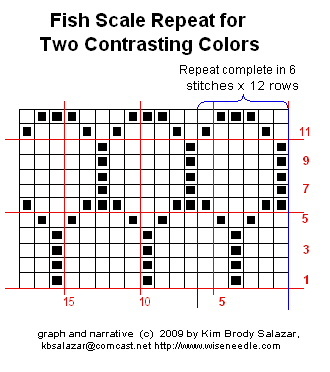 If you’re working your own fish hat and want to do stranded scales, here’s my six-stitch repeat. It fits nicely into the 90 stitches around segment of the body, and the clever can probably work it into the decreased sections as the body slims down towards the tail, which are also multiples of six. Click on the thumbnail below for the full size version. Well, not a mess, actually. Some pretty good but goofy fish. These are two fish of my manufacture and one of Elder Daughter’s. Elder Daughter made the gold face, ultra stripy hat for herself (and in the process learned a lot about darning in ends). I made the slightly less stripe one for her younger sibling (dark orange mouth and fins). We worked on them while we were visiting our Buffalo family, and in the process my niece and nephew were likewise fish-smitten. Being a soft touch, I agreed to make two more. 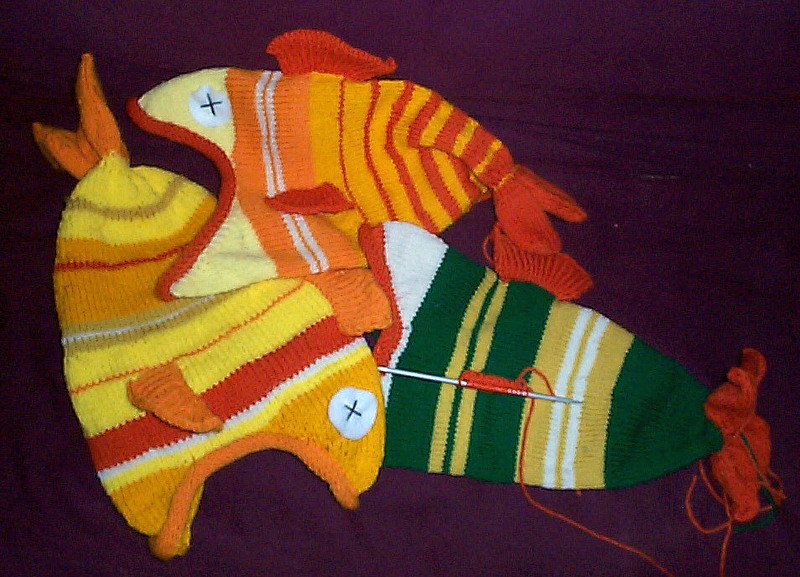 The half finished green/gold/white fish is for nephew Justin, he of the blanket pattern, now a middle school kid. 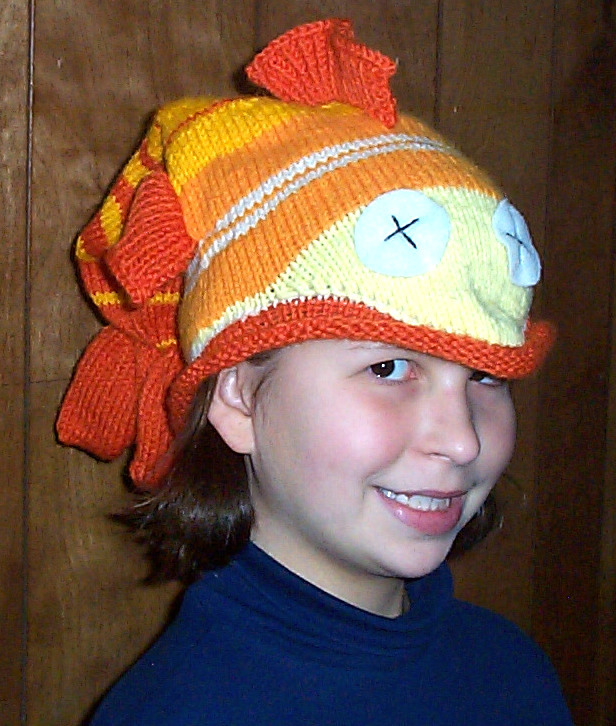 I’ll be starting younger niece Veronica’s fish hat later today. She’s requested softer blues, greens and pastels. I’ll do my best out of my stash; but be they pastel, screaming oranges and golds, or in-your-face green, these hats are a supremely silly must-haves. At least in this family. Kudos to Thelma Egberts and her muse Jonas, Master of Fish! 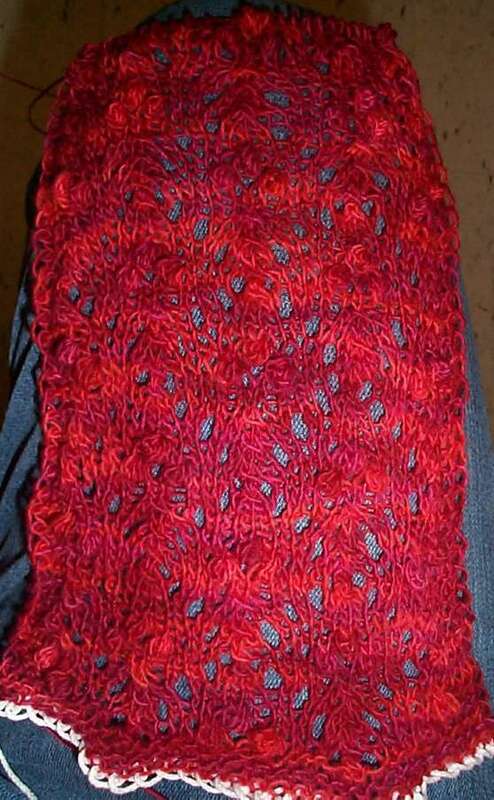 Here you see the Estonian Lace Scarf by Nancy Bush I started back over Thanksgiving. I ripped it out began again, using a US #6 for the Malabrigio Baby Merino Laceweight instead of the #4 recommended for the laceweight named in the pattern. The look and drape are both MUCH better. Although red photographs poorly, and my own lousy camera skills don’t help, in real life you can see the small nupp style bobbles, which now look like soft cranberries dotting the surface. I don’t know if I’ll be able to make this the recommended length and still have enough left over to do the specified edging. If not, it can live unedged, or with something less yarn-voracious of my own devising. Stay tuned to see how this challenge will be met. But in the mean time I made the mistake of showing my kids the Fish Hat from the latest edition of Knitty. They’re totally smitten. Especially because they know I’ve got a pile of lurid orange and yellow acrylic sitting around, just waiting to become a pair of randomly striped ultra silly goldfish. I may have to do up a couple of these over the holiday, just to keep the peace. Oh. And to enable a local rendition of the classic Fish Slapping Dance. 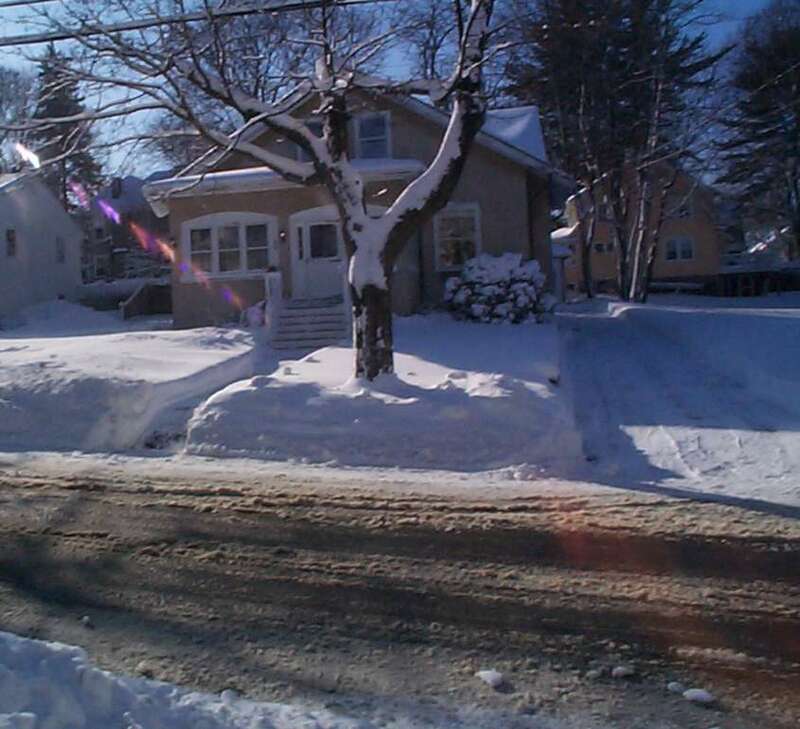 Finally, happy holidays to all from us here a slightly snowy Casa Magnifica, somewhere in Eastern Massachusetts.